Market dominant forces have the capacity to control many variables of the market, variables that shift over time and keep smaller retail traders and investors off balance and constantly adjusting. These variables are typically agreed to be things like support and resistance levels, time based movements, and to a large degree price action and even volume patterns. One of the lesser known manipulated variables of market movers is Volatility….or market “speed”. 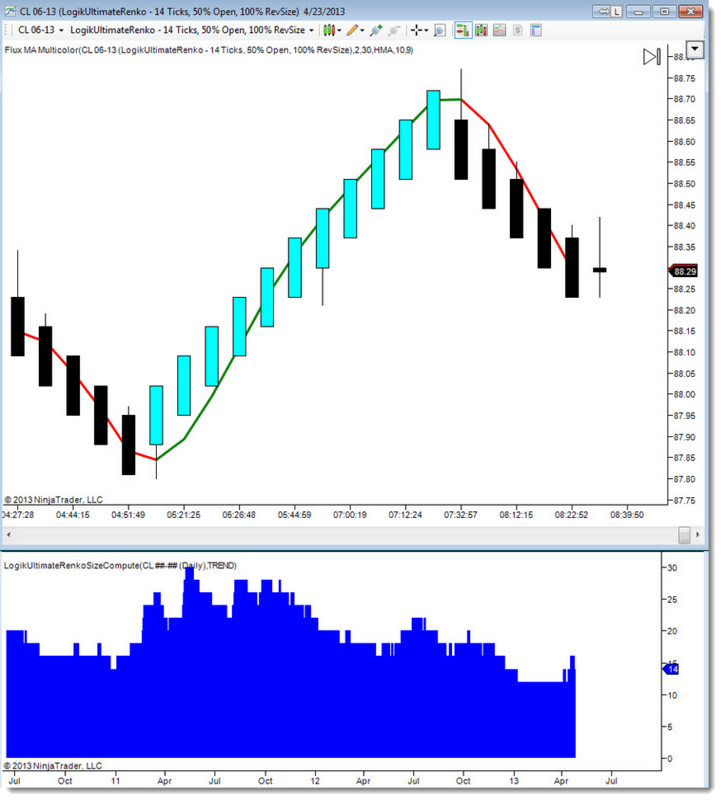 Increasing market speed and volatility has several destabilizing effects on smaller traders and investors, and especially wreaks havoc with models that are based on fixed tick, range, or renko values. Traders that remain static when the market volatility changes risk more frequent stop hits and runs, and targets that leave the proverbial “money on the table”. 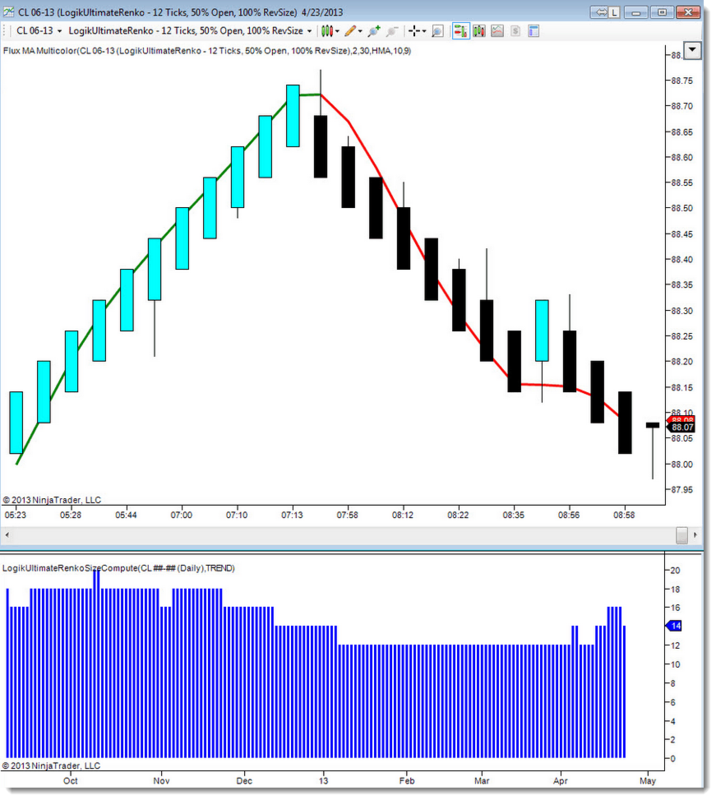 In this example you can see that the Ultimate Renko Size Computer value is in fact changing with market volatility, achieving a value of 20 ticks in the fall, and subsiding back to a level of 12 ticks in the early spring. The goal of the retail trader and investor is to see turn signals early enough to secure the lowest risk potential entry as possible. Using too small of a brick size however would create multiple false signals, and whipsaw a trader out of their positions. Using too large of a brick size increases signal lag as well as risk size – encouraging “trade chasing” which is equally detrimental. Can you observe the spurious signal reversal bar that occurs at the lower, “non-optimal” level? By using the UltimateRenkoSizeCompute indicator, we’re in the “optimal” zone where the bar is small enough to detect major shifts in trend for reversal entries or exits, but large enough to keep traders in moves and not paint unnecessary reversal bars or chop zones. Because the UltimateRenko is “dialed in” to market volatility so precisely, we can leverage that information for a truer representation of trend. By referencing the color of the bricks, traders can then use a signal like the Flux Broadhead to trade in the direction of the trend as a non-lagging reference base. In this example, we have an optimal brick size of 14, with reversal bars A and B indicated on the left size of the chart. Once the reversal bar is in place, we can apply the Flux Broadhead with a +/- 50 value to hunt for pullbacks in the direction of the overall trend. 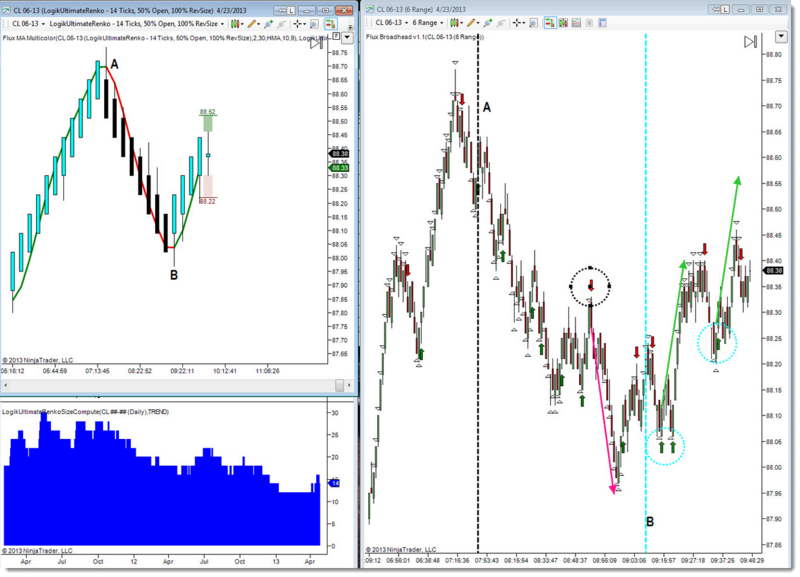 You can observe these entry bars as indicated by black dotted circles (short) and cyan dotted circles (long). Many traders will opt for the first pullback only – with some traders electing to limit the number of pullback entries to no more than 3. Whichever methodology you subscribe to, it’s very easy to see the advantage of using the Size Compute tool to maintain adequate volatility references.